Doubly charged Higgs bosons and lepton number violation are wickedly cool. The Standard Model (SM) of particle physics is presently the best description of matter and its interactions at small distances and high energies. It is constructed based on observed conservation laws of nature. However, not all conservation laws found in the SM are intentional, for example lepton number conservation. 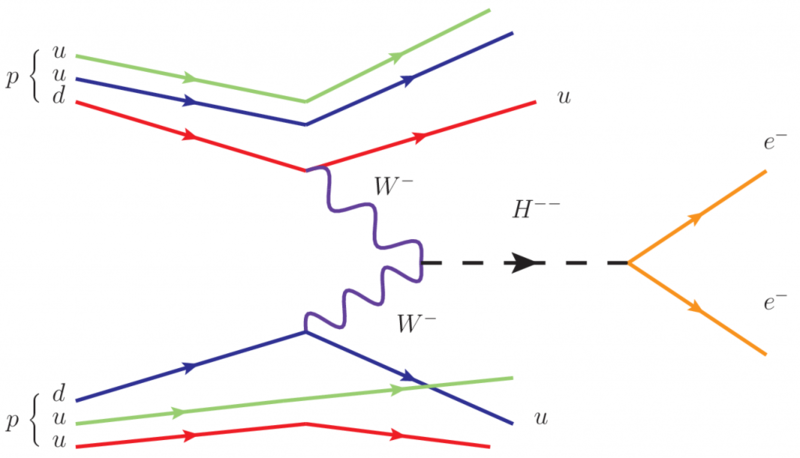 New physics models, such as those that introduce singly and doubly charged Higgs bosons, are flexible enough to reproduce previously observed data but can either conserve or violate these accidental conservation laws. Therefore, some of the best ways of testing if these types of laws are much more fundamental may be with the help of new physics. Conservation laws, like the conservation of energy or the conservation of linear momentum, have the most remarkable impact on life and the universe. Conservation of energy, for example, tells us that cars need fuel to operate and perpetual motion machines can never exist. A football sailing across a pitch does not suddenly jerk to the left at 90º because conversation of linear momentum, unless acted upon by a player (a force). This is Newton’s First Law of Motion. In particle physics, conservation laws are not taken lightly; they dictate how particles are allowed to behave and forbid some processes from occurring. To see this in action, lets consider a top quark (t) decaying into a W boson and a bottom quark (b). (+2/3)e ≠ (+1)e + (+2/3)e.
we see that electric charge is conserved. The top quark-bottom quark-W boson interaction terms in the Standard Model. Bars above quarks indicate that the quark is an antiparticle and has opposite charges. L=0 to all other particles. The W boson-neutrino-electron interaction terms in the Standard Model. Bars above leptons indicate that the lepton is an antiparticle and has opposite charges. However, lepton number conservation is not required to explain data. At no point in constructing the SM did we require that it be conserved. Because of this, many physicists question whether lepton number is actually conserved. It may be, but we do not know. This is indeed one topic that is actively researched. An interesting example of a scenario in which lepton number conservation could be tested is the class of theories with singly and doubly charged Higgs boson. That is right, there are theories containing additional Higgs bosons that an electric charged equal or double the electric charge of the proton. Models with scalar SU(2) triplets contain additional neutral Higgs bosons as well as singly and doubly charged Higgs bosons. (+2)e ≠ (+2/3)e + (+1/3)e.
(+2)e = (+1)e + (+1)e.
For the decay into same-sign W boson pairs, the total lepton number is 0L + 0L + 0L = 0L. In this case, lepton number is conserved! For the decay into same-sign leptons pairs, the total lepton number is 0L + (-1)L + (-1)L = -2L. In this case, lepton number is violated! Doubly charged Higgs boson interactions for same-sign W boson pairs and same-sign electron pairs. Bars indicate antiparticles. C’s indicate charge flipping. Therefore if we observe a doubly charged Higgs decaying into a pair of same-sign leptons, then we have evidence that lepton number is violated. If we only observe doubly charged Higgs decaying into same-sign W bosons, then one may speculate that lepton number is conserved in the SM. Doubly charged Higgs bosons do not interact with quarks (otherwise it would violate electric charge conservation), so we have to rely on vector boson fusion (VBF) to produce them. VBF is when two bosons from on-coming quarks are radiated and then scatter off each other, as seen in the diagram below. 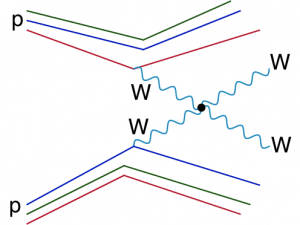 Diagram depicting the process known as WW Scattering, where two quarks from two protons each radiate a W boson that then elastically interact with one another. 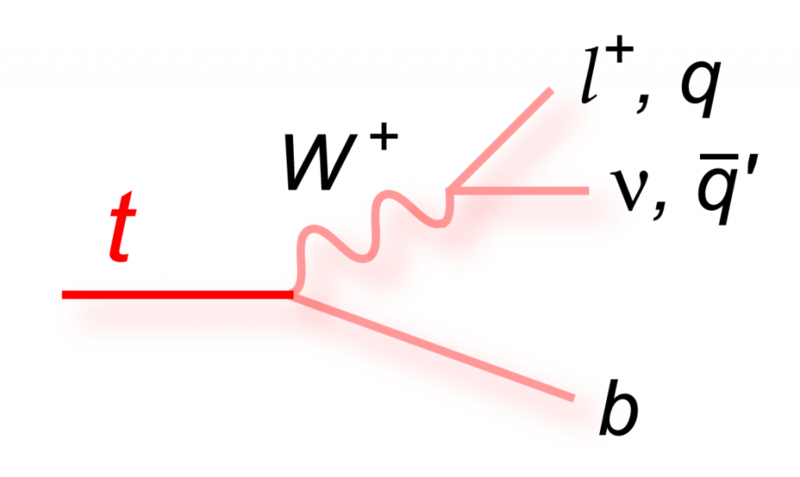 If two down quarks, one from each oncoming proton, radiate a W- boson (-1e) and become up quarks, the two W- bosons can fuse into a negatively, doubly charged Higgs (-2e). If lepton number is violated, the Higgs boson can decay into a pair of same-sign electrons (2x -1e). Counting lepton number at the beginning of the process (L = 0 – 0 = 0) and at the end (L = 0 – 2 = -2! ), we see that it changes by two units! Same-sign W- pairs fusing into a doubly charged Higgs boson that decays into same-sign electrons. If lepton number is not violated, we will never see this decay and only see decays to two very, very energetic W- boson (-1e). Searching for vector boson fusion as well as lepton number violation are important components of the overarching Large Hadron Collider (LHC) research program at CERN. Unfortunately, there is no evidence for the existence of doubly charged scalars. On the other hand, we do have evidence for vector boson scattering (VBS) of the same-sign W bosons! Additional plots can be found on ATLAS’ website. Reaching this tremendous milestone is a triumph for the LHC experiments. Vector boson fusion is a very, very, very, very, very rare process in the Standard Model and difficult to separate from other SM processes. 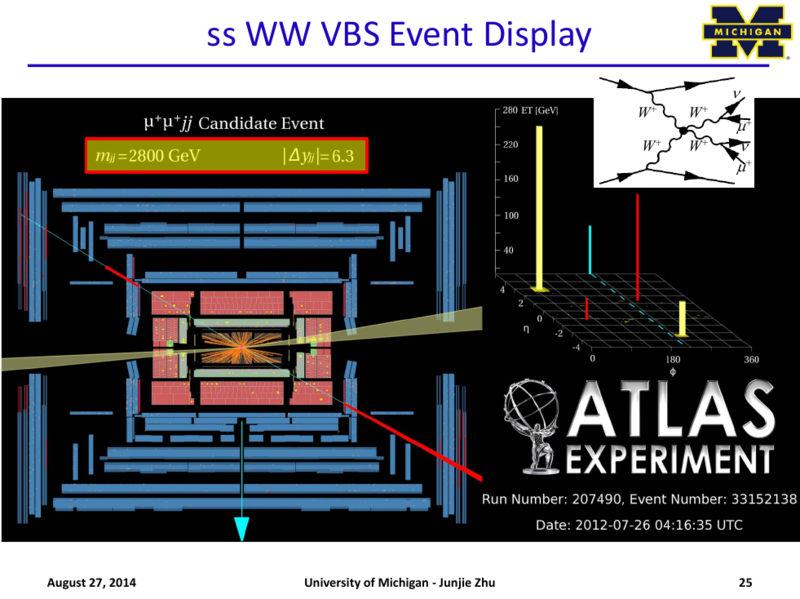 Finding evidence for it is a first step in using the VBF process as a probe of new physics. We have observed that some quantities, like momentum and electric charge, are conserved in nature. Conservation laws are few and far between, but are powerful. The modern framework of particle physics has these laws built into them, but has also been found to accidentally conserve other quantities, like lepton number. However, as lepton number is not required to reproduce data, it may be the case that these accidental laws are not, in fact, conserved. Theories that introduce charged Higgs bosons can reproduce data but also predict new interactions, such as doubly charged Higgs bosons decaying to same-sign W boson pairs and, if lepton number is violated, to same-sign charged lepton pairs. These new, exotic particles can be produced through vector boson fusion of two same-sign W boson pairs. VBF is a rare process in the SM and can greatly increase if new particles exist. At last, there is evidence for vector boson scattering of same-sign W bosons, and may be the next step to discovering new particles and new laws of nature!